The two-year old partnership between Special Olympics and the Kentucky High School Athletic Association to provide Unified Sports opportunities in Kentucky high schools is already expanding. Bowling will be added as the second official KHSAA Unified sport beginning with the 2016-17 bowling season. During its regularly scheduled meeting at the KHSAA Offices on Wednesday, the Board of Control approved a proposal to add Unified and Adapted opportunities in the sport-activity of Bowling, beginning with the 2017 state championship. Bowling will be the second KHSAA offering to include Unified and Adapted opportunities, joining Track & Field which began including Unified events in 2015 following a joint partnership between KHSAA and Special Olympics Kentucky. The Unified Bowling events will be added to the singles competition on Feb. 9, with a final schedule to be announced at a later date. Unified sport allows for combined competition involving students with and without intellectual disabilities, while adapted sport allows for participation by those with a physical disability. 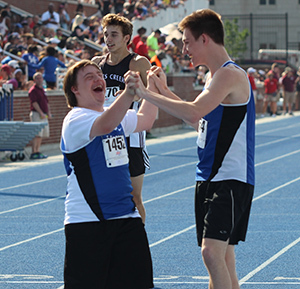 An Eastern High School athlete and Unified partner celebrate at the end of the Unified 100-meter dash at the 2016 KHSAA State Track and Field Meet. The Special Olympics Kentucky/KHSAA partnership began in 2015 with the addition of Unified Track and Field as a recognized high school sport. The first year saw three schools participate in the program. The following year that total grew to 22 schools, and more are expected for the 2017 track and field season. The KHSAA Unified Sports partnership is part of SOKY’s Unified Champion Schools Program (Project Unify) initiative. The Unified Champion Schools program is aimed at promoting social inclusion through intentionally planned and implemented activities affecting systems-wide change. With sports as the foundation, the three component model: Whole School Engagement, Inclusive Youth Leadership and Unified Sports offers a unique combination of effective activities that equip young people with tools and training to create sports, classroom and school climates of acceptance. These are school climates where students with disabilities feel welcome and are routinely included in, and feel a part of, all activities, opportunities and functions.